Please read carefully the following terms and conditions of use of the Website. Each time you use the Website, you agree to accept fully and without reserve the terms and conditions contained herein and undertake to comply with them. If you do not agree or do not accept the following terms and conditions, please refrain from using the Website. Visitor of the Website shall be considered any Internet user visiting the website www.chromatographyspares.com without taking any action to either register to the e-shop or place an order for products. User of the Website shall be considered any Internet user who registers and / or places an order to the e-shop. The Website is the online shop (e-shop) designed for the exhibition and sales of Chromatography products, having independent pricing policy, terms of payment, marketing and delivery of products. To see the contents of his/her "Shopping Cart". The User can buy products and change the type and/or the quantity of the desired products in each order. To finalize his/her orders and pay according to the payment methods provided by the e-shop. To modify the Account Information as described in detail below. To see his/her history of orders, to check the credit clearing and use electronic discount coupons. Chromatography Spares reserves the right to modify or suspend temporarily or permanently the service with or without notice. 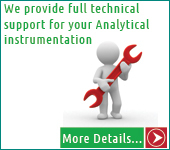 In any case the User uses the services of the e-shop, it shall be deemed that he/she has unconditionally accepted the terms of this disclaimer and recognizes without prejudice that the online store www.chromatographyspares.com shall not be liable for any modification, postponement or interruption of service. All orders already placed before any temporary or permanent interruption of the service will be properly executed. A. Data recorded during registration of new user: When registering to the e-shop, which is necessary in order to enable the User to place an order, the following registration information will be requested: Title, First Name, Last Name, Email Address, Company name, Address, Postal Code, City, Country, Phone Number. The above information is necessary for the order to be processed by the e-shop and will be used exclusively to serve the order of the user. have registered through to the e-shop. The collection of personal data is necessary to support their transactions via the Website, i.e. to place their orders and receive special services such as history of orders, address list, etc. has stopped using the services of the Website. has no debts towards Chromatography Spares. Chromatography Spares may keep a record and process personal data that Users voluntarily submit to the Website, always in accordance with the applicable provisions protecting individuals from the processing of personal data and under maximum safety procedures. The Users of the Website acknowledge and accept the maintenance and processing of their personal data for the purposes for which they are submitted to Chromatography Spares. In any case, any subject to personal data, maintains all the rights concerning personal data provided by the relevant existing legislative framework; namely the right of information, right of access right of objection and right to ask for provisional judicial protection against Chromatography Spares. The Users are solely responsible for any registration of personal data by third parties on the Website without the necessary authorization / consent and for submitting false, untrue or inaccurate information and data in order to defraud or mislead. Chromatography Spares reserves the right to use or disclose personal data of Users, if required by law or as a sign of good faith when such action is deemed necessary in order to (a) comply with the law, (b) protect the rights and property of Chromatography Spares (including but not limited to cases of false or inaccurate registration, partial or non-payment of an order etc. or (c) act in urgent circumstances to protect the Chromatography Spares staff, the consumers of Chromatography Spares products or the public. The User prepares the order adding the products he/she wishes to purchase to his/her "Shopping Cart" following a simple step by step process provided by the Website. Once asked to confirm the order, the shipping address of the products and shipping address of the invoice, he/she will be asked to proceed to payment, choosing one of the suggested ways of payment. Chromatography Spares guarantees the confidentiality of transactions from its part. Chromatography Spares strives for the proper functioning of the e-shop, but in any case does not warrant that the operation of the Website / its servers and/or third party websites through which its content is being transmitted will be smooth and uninterrupted, free from viruses and similar threats. Chromatography Spares therefore bears no responsibility for any possible damage caused to the Visitors/Users of the Website or to others, which will be associated with the operation of the above. Chromatography Spares explicitly states that it cannot and may not be required to verify the safety and content of other web pages, however it maintains the right to terminate access to any website if it detects any event which in its opinion is inconsistent with the law and these terms. Chromatography Spares is committed to delivering high quality products in a package suitable for safe transportation. Chromatography Spares will be liable only for intent and gross negligence in the event of delay in delivery of the ordered goods and information the company gives or services provided through the Company’s website. Note: The Website does not store or process the details of credit/debit cards. Not to violate any form of Intellectual Property rights of third parties. To provide true, complete and correct account details when registering. To update his/her account information in order to meet his/her true current personal information. In case of inaccuracy in the registration information of the User, Chromatography Spares reserves the right to immediately disable the user account. 5. To confirm that has signed out of the account at the end of each session. 6. To provide correct and accurate details of payment and delivery and invoice addresses regarding orders placed in the e-shop. These terms and conditions are governed by the provisions of Greek Law, Directives and Regulations of the European Law and the relevant international provisions, as applicable and interpreted in accordance with the rules of good faith, business ethics and the economic and social purpose of the right. The invalidity of a particular term does not affect the validity of the remaining terms, but the particular term ceases to be valid. Any failure of Chromatography Spares to exercise a right or condition arising hereunder shall not constitute a waiver of it.